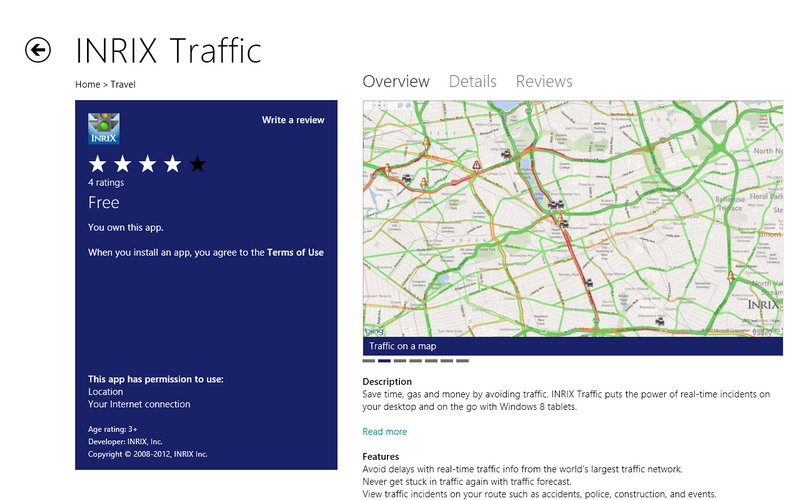 Today, the INRIX Traffic app debuts in Windows 8 store. If you’ve been using Windows Phone 7, then this app needs no introduction. But for those of you new to this app, the app shows you the traffic condition in your current area. Through this information you can plan your journey to avoid traffic jams. I have played around with the App. It works as advertised. Scrolling is smooth. The Map is moved around smoothly with touch or mouse. Zoom-In and Out is also flawless with Pinch-to-zoom, and the mouse scroll wheel Zooms in or out also. App-bar brings thumbnails of traffic history of your current location at the top. With this you can predict what typical traffic condition of the area. You can scroll horizontally this top app-bar to go to your time-slot of choice. Click on the thumbnails to view the Traffic History. The lower App-bar gives option to zoom to your current location if you’ve panned away from your location. You also have the option to show Accidents and other events along the way. The Application uses the Location Services of Windows 8, so expect to grant the App access to your location services. As usual, the Apps I feature in my NewAppAlerts blog entries are not yet visible in the store. You will need to search for the app to find them. Open Windows Store, bring up the Charm and search for INRIX. Download the app and have safe journey through the traffics. Thanks for the first review. We welcome all your readers’ feedback and ideas at mobilefeedback (at) Inrix (dot) com. Thanks for your comment. I am a fervent user of your app on WP7, so you can imagine my joy when I found the App on Win8! Now my tablet usefulness has gone up a notch! And may I say, thanks for making it free. And keep up the good work. We will continue to spread the good news about the app.